The two mounds furthest from the cliff will not be excavated on this occasion. Each mound measures about 15m (49ft) in diameter. It is not known exactly how high each one is because they have been covered by sand blown in from the cliff edge. Each one currently stands at about 1m (3ft) high. Preliminary excavation work was carried out on the mounds in May 2009. It is hoped the current excavation will uncover more about the people who originally built them. Martin Papworth, a National Trust archaeologist, said: "These Bronze Age round barrows are important features of the landscape of Dorset and have a valuable story to tell, but the archaeological information contained in these burial mounds can only be preserved through excavation and record." All five burial mounds are expected to be lost through cliff collapses in the next 50 years. Mr Papworth added: "The barrows are scheduled monuments and English Heritage has granted permission for the National Trust to excavate the most vulnerable parts of the barrow group." It is thought the mounds would have been about two miles inland at the time they were built. In June 1992 a trench was excavated across the south-west barrow, which dates to about 2000BC. 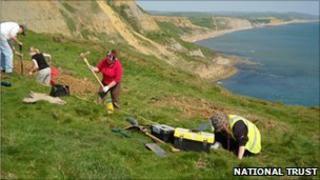 It was found that 30% of this mound had already been lost through coastal erosion. In 1800 half of it was dug into to create a signal station to warn against attack by Napoleonic forces during the French invasion. The current excavation will be funded as part of the South West Coast Path Unlocking our Heritage Project largely financed by the European Agricultural Fund for European Development. The excavation work is expected to last until 3 June.